Description: The fifth Friends of the Earth International annual photo competition is carried out this year for the first time in collaboration with La vía Campesina and the Movement of Victims Affected by Climate Change. 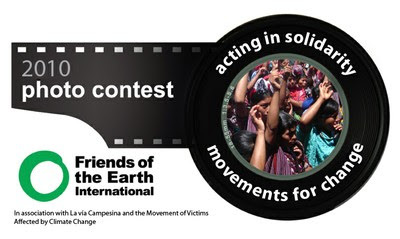 This international photo competition will gather photos from around the world on the theme of “Acting in Solidarity and Building Movements for Change”. Acting in solidarity is when people join together to support each other's struggles. It involves understanding, responsibility, commitment, and for people in many parts of the world, great courage. Without solidarity, movements cannot grow and bring about the social, environmental, economic and political change that people around the world are calling for. Photos that capture the essence of solidarity between people: people connecting and supporting each other, often transcending boundaries of age, race, gender and class, in order to reach a common goal. Solidarity implies courage, emotion, connection and collaboration. Photos that capture the power and passion of movements for social and environmental change. These might include marches, demonstrations, protests, vigils, non-violent direct actions, occupations, festivals, and so forth. Akintunde Akinleye, first-place winner World Press Photo 2007, from Nigeria (www.akintunde1.com). Bangladeshi photographer G.M.B. Akash, winner of many prestigious global awards and first-place winner of the 2006 Friends of the Earth International photo competition (www.gmb-akash.com). Peter Menzel, award-winning US photojournalist and author of “Hungry Planet: What The World Eats," (www.menzelphoto.com). Award-winning Dutch photojournalist Kadir van Lohuizen, author of Diamond Matters (www.lohuizen.net). Luis Romero, Associated Press photo journalist from El Salvador. Prizes: The judges will choose a total of 12 winning photographs (6 from each category), as well as three “popular choice” photos per category that will be selected by the member groups and allies. There are cash prizes for the winners: 400 euros for each first place photo; 200 euros for each second place photo; and 100 euros for each third place photo. The best shots will be featured in materials produced by these organizations and social movements, including a 2011 calendar and an international photo exhibition. Eligibility: The competition is open to everyone, and the organizers particularly encourage women, young people, and people living in the developing world to enter.